Harsh work environments require rugged electronics that can withstand tough demands while providing crucial tools for maintaining the safety of personnel and equipment. 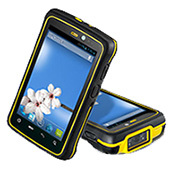 Winmate's rugged next-generation Android handheld device does just that. With certified protection shock, dust, liquid, vibration and extreme temperatures, it can withstand the harshest working conditions. 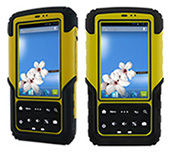 That coupled with the device's robust data collection capabilities, innovative sensors, and advanced connectivity options, this industrial handheld device is designed for safety, reliability, and durability. A German pest-control company adopted the Winmate Rugged E430RM4 Handheld to manage and track the status of their poisoned bait system in a waste water treatment plant. With innovative sensor technology and robust data collection capabilities, the Winmate device is able to provide information about the location of the bait and life of the poison in use. The device's wireless connection allows them to monitor the poison bait system from up to 100m, minimizing contact between the worker and the bait system - increasing productivity and protecting workers from the hazardous environment of sewage pipes. In addition, the integrated precision GPS allows them to accurately locate their equipment to prevent loss and the 3G connection provides fast and uninterrupted connectivity to further improve productivity. 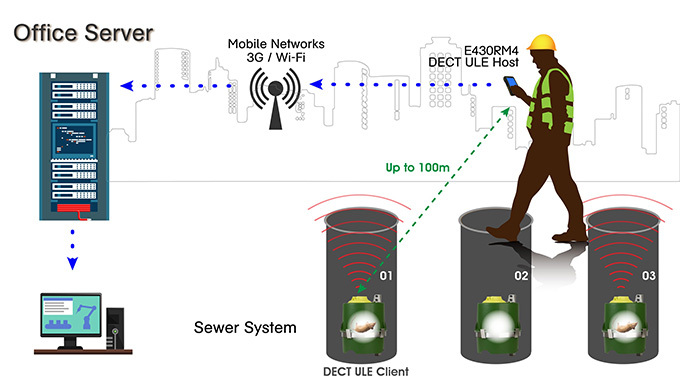 In this diagram, the E430RM4 with the DECT ULE Host acts to detect and measure the poisoned bait system in the sewer's wastewater pipes - protecting workers from the hazardous environment. 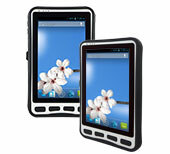 The device's integrated 3G allows uninterrupted connectivity with the main office server and management.